UPPER EAST SIDE — It's possible to have almost anything delivered home in the Big Apple, from Chinese food to Christmas trees to karaoke machines. Now, New Yorkers can add a new delivery option to the list: a personal home visit from a leather furniture repairman. 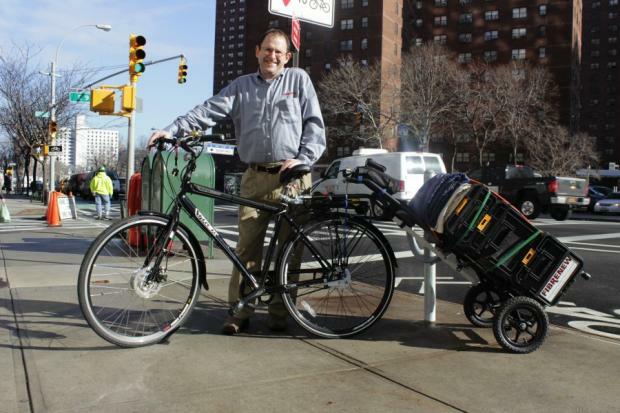 Saul Shapiro, a longtime bike enthusiast, travels on his 7-speed from his Upper East Side apartment to any Manhattan location to fix clients' worn and torn sofas, chairs and ottomans. He hauls about 100 pounds of equipment, including an airbrush painting system, behind his bike in a trailer he built by combining three carts, road-ready wheels and a strong hitch. “I’ve had people stop me and say, ‘I love your cart,’" said Shapiro, a former engineer and public relations staffer who opened the city's first franchise of Fibrenew, a company that specializes in repairing leather and vinyl upholstery. "One woman stopped to ask me where I bought it because her husband is always trying to drag a telescope around on his bike." Most furniture repair businesses charge a couple hundred dollars just for pickup and delivery, he and his customers said. But Shapiro saves money by not renting a storefront or workshop, and is able to pass those savings on to his clients. Shapiro estimated that most of his jobs cost between $300 to $400 per piece, cheaper than the thousands of dollars apiece it would cost to reupholster them. Shapiro said he started the upholstery business last year, as a way to tap into his hobby of making furniture on the side. Shapiro repairs commercial and residential furniture, with much of his business coming from the offices of doctors, lawyers and therapists. He uses proprietary polymers and epoxies to repair deep scratches or tears, and then custom mixes colors to re-dye the damaged area. Shapiro said he currently does between 15 and 20 jobs each month, but is hoping to eventually double that number. Olga Grigorenko, a project manager at Buero New York, a design firm that hired Shapiro to repair two torn leather sofas, said his services worked perfectly for the company's needs. "He did a very thorough job," she said. "He obviously knew what he was doing, and the couches looked great when he finished." The firm saved money by hiring Shapiro, Grigorenko said. "It was a massive amount," she said. "To reupholster would have been significantly more." Ellen Daniels, a therapist, needed to repair the leather recliner and ottoman she uses in her practice. "I've had it for 12 years," she said of the recliner, "and it had really gotten beaten up with all of these cracks and tears and worn spots." As for the ottoman, which was being held together with duct tape, an upholstering company told Daniels it was beyond repair. She looked into replacing the set for $2,500, but instead hired Shapiro, who charged $750 to fix both items. "Now the chair looks as good as new. And the ottoman — it was like he had to perform surgery on the poor thing — but he put it back together," she said. "It's magnificent."